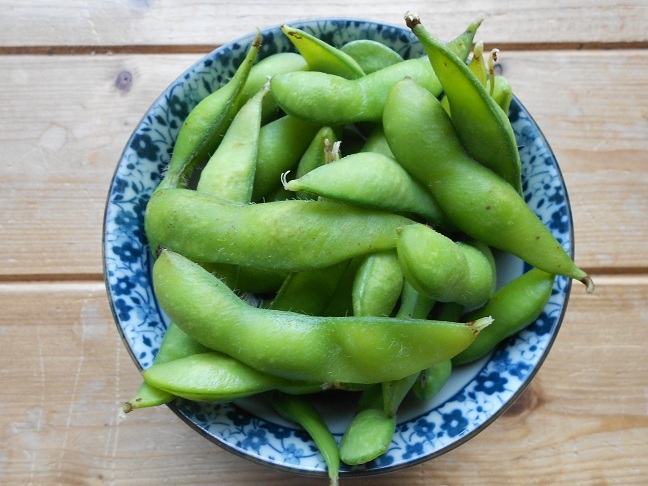 Edamame, the Japanese name for edible soy beans, are packed with health benefits, so it's no surprise that they're becoming more and more popular as a snack all over the western world. They are relatively inexpensive, easy to prepare and very healthy. If you haven't tried edamame before, here's how to get started! You can buy edamame frozen or fresh, in its shell or just the beans. Personally I prefer to buy them in the shells because it locks in the flavor, and when you open the shell, that hit of soy bean flavor is released just as you are ready to eat the beans inside. Edamame is a very healthy snack, and is surprisingly filling. The reason it deserves to be called a superfood is because it’s so packed with nutritional benefits. Edamame is rich in protein, meaning it’s a great food for vegetarians who may not have as much protein in their diet as meat eaters. It is also rich in vitamins A and C, which are beneficial antioxidants, helping the body to reduce the effects of harmful free radicals. Additionally, Edamame is believed to have health benefits. According to the FDA, eating soy protein, as part of a low cholesterol and low saturated fat diet, can help to reduce the risk of coronary heart disease. It is also believed that eating Edamame may help to ease menopause symptoms. This is my favorite (and probably the easiest) way to eat edamame. Simply steam in a steamer or steaming basket over boiling water for around five minutes until tender. Don't over-steam them. Sprinkle with salt, then pop the shell open with your teeth, pushing the beans straight into your mouth. Discard shells. Place beans in boiling, salted (optional) water for around 3 – 4 minutes, or until the beans are tender (take one out to test). You can sometimes notice the beans starting to split open when they're ready. Don't cook for longer than five minutes as they can go soggy. The edamame are now ready to eat! If desired, sprinkle with salt, then pop the shell open with your teeth, pushing the beans straight into your mouth. Discard shells. If you’re watching your salt intake then, of course, reduce or limit the amount of salt you add. Edamame is flavorful on its own but adding salt is many people’s preferred way of eating it. Remember, there are lots of different ways you could eat edamame for when you want to mix things up a bit. Try adding chilli for heat and a twist on your snack. You can also remove and cool the beans then serve with chopped apple, red cabbage and sultanas for a really sweet salad. Have fun experimenting with this tasty, healthy food!